Yidi | How to design for facilitating relationships? How to design for facilitating relationships? It was a usual afternoon, I was fighting a fierce dragonhawk alone in Eversong Woods. I desperately wanted to cast that final backstab before I got killed by that creature. All of a sudden, I saw a holy light rise from my body- I was healed and got a chance to land that final attack for victory. It was a strange priest who was just passing by. We soon became good friends and started traveling in the world of Azeroth together. I was standing in a dark temple. It looks peaceful, but some giant dragon-like creatures were roaming in the air, with scary eyes scanning the area, searching for some prey. I moved meticulously, hoping those creatures will never notice my existence. I was frightened and confused when I saw someone looks just like myself appeared. I was wondering if he was hostile until he gave me energy and lead me toward a shelter. We became companions. He is good at finding shelters, while I could always warn him when some dragon-like creature got close to him. We went through the rest of the journey together. Some of you may have already guessed, I'm talking about my experience with World of Warcraft (WoW) and Journey. These games are extremely good at triggering friendships between strangers through simple but meaningful interactions. I was fascinated by the power of such games and brilliance of game design, and was wondering whether it’s a good idea to make games that enhance relationships between acquaintances, rather than strangers. Lucky enough, I got a chance to design a two-player cooperative VR games (Althea) that focuses on relationship building during the round 5 of Building Virtual Worlds class, and I’m currently working on a project (Prism) that focuses on facilitating relationship between grade 3 and 4 neurotypical students and their autistic peers through metaphoric gameplay. Althea and Prism are tackling the problem from different angles: Althea utilizes direct interactions between two persons, while Prism is targeted at neurotypical students only, and hopes to facilitate relationship indirectly by transforming players. In this article, I will share my experience and insights for designing such games. Giving players plentiful opportunities to help each other is a very strong way to facilitate relationships. It appeared in both examples above. In Journey, players help each other by giving each other energy when staying close, and warn each other of potential dangers by singing. It was symmetrical - the capability of each player is similar (varies a little bit depending on the length of the scarf), so it’s very hard to tell whether someone is taking high status or low status. Players appear to be equally important to each other in a symmetrical setting. While in WoW, each class has its own unique characteristics, and the power of each character varies a lot, depending on level, gears, player skill, etc. Therefore, the capability of helping each other is asymmetric. In most (certainly not all) circumstances, it’s easier to tell who is the stronger one, and who is the one being helped. I often find symmetric superior to asymmetric in this context. By giving different players equal capabilities, everyone gets the chance to help and receive help. This mutual act of helping make players care about each other. Also, the act of help in Journey forms a positive feedback loop, so players are more and more willing to help. In such situation, players want to work with each other and go through the rest of journey together. In turn, the long journey provides more opportunities for them to show mutual support and develop stronger friendship. While in an asymmetric setting, the stronger one tends to feel more like a mentor and thus superior. They are no longer equal peers. When the asymmetry gets extreme, the stronger one will find out that the more he helps others, the slower he can advance himself. Their paths would soon get parted, and lose further opportunities of building relationships until the weaker one catches up. While in Althea, our team took a new approach, where two players are vastly different but still equally important. One character is a hooded figure, who walks on the ground and has the power to throw rocks. The other character is a weak fairy, who flies in the air and has the ability to manipulate magic. You can probably tell, the obstacles in this game are designed to require cooperative force to overcome. For example, in the first level, our characters are trapped in a hall and need to find a way to open the gate. To open the gate, the fairy needs to draw a glyph at the bottom of a goblet. However, that goblet is covered by dangerous fire butterfly that will hurt both characters. To get rid of the butterflies, the hooded figure needs to stand on a trigger plate which is located in the hall. This first level not only requires each player to be smart enough to find what they need to do, but also requires both of them to exchange information and work together. They need to understand their collective capabilities and find ways to use them. Althea is filled with such cooperative puzzle solving activities and mutual help opportunities, and turned out to be successful. I was almost moved to tears when I saw two playtesters hug each other after playing the game. In addition to deliberately designing mechanics that encourage help and cooperations, there is one thing to avoid when designing such games. That is, no player should have the feeling that he is being dragged back by the other player, or feel like the act of helping others in weakening himself. This situation is common in most zero-sum games. In the early stage of Journey, players need to gather energies, and the way players help others is by directly giving energies to them. Jenova (2013) mentioned that, playtesters reported the feeling of not wanting to help because that action will make themselves progress slower. The takeaway is that, each player’s capability of helping should be equal or similar; the act of helping should provide positive feedback; and helping should not be at the cost of losing. Up till now, we've been talking about the effectiveness of symmetric power for symmetric relationships, like peers. However, not all relationships are symmetric, and not all interactions need to be symmetric. Asymmetric design also has its own value. World of Warcraft provides a built-in social organization - guild, which encourages advanced players to help novice players grow quicker and better. WoW also encourages existing players to invite their friends into the world. As a result, it's common to see players at a higher level help players at a lower level through quests, dungeons, and PvPs. These interactions are certainly asymmetric, but they can still make both parties feel good. Another kind of relationship - mentorship, rather than friendship - is facilitated in these scenarios. Similarly, Journey rewards advanced players with a special white cloak to distinguish them from novice players. Players in white cloak usually play the role of mentors in interactions with new players. Conquering obstacles together becomes mentoring activity rather than friendship-building activity. To conclude, a designer needs to think about the type of relationship he/she is trying to facilitate, and design the action of help around the goal. In his book “Understanding Comics”, McCloud suggests that amplification can be achieved through simplification. He talks about this idea in the context of characters. The more simplified a character’s appearance and the setting are, the easier for his traits to stand out, and thus the easier for the audience to relate to that character. I think this rule can apply to both mechanic design and character design. On the mechanic design side, I think it’s wise to simplify interactions so we can amplify the essential experience. It sounds dumb and obvious, but eliminating unnecessary mechanics to the degree that the player doesn’t have much to do rather than interacting in the ways we really want them to, is a really effective way to deliver the essential experience. Jenova talked about how he took this approach in Journey. In the earlier phase, the game still support collision between players. During playtesting, players tend to push other players off the cliff so they feel powerful - nothing is more powerful than determining others’ life. However, that’s definitely not something the team wants to see in Journey, so they simplify took collisions out. In the shipped game, players have no capability of hurting others, the only way to interact with other player is singing and giving energy. In this way, players have left no choice but interacting with others in a friendly way. Sounds a little bit cruel and heavy-handed, but this is the power we get as game designers! The same design philosophy was applied in Althea. In the game, players don’t have the ability to deal damage or push the other player off the cliff. Collisions between players are also removed, heck, even the collisions between rocks and players were removed. So the player gets no feedback from the action of throwing rocks at others or pushing others. Even they try to do that, it gets boring quickly. On the other side, the game encourages friendly interactions by giving rich feedback. For example, freeing fairy from a flower by hitting that flower with a rock provides all-rounded satisfying feedback. This is how games can encourage positive social interactions. The “amplification through simplification” rule can also be applied to character design. When designing a character that we want players to relate to, removing signs of gender, religion, race, etc., can be a piece of advice. Journey did this by removing signs and making a mystery figure. Chris Bell, the designer of indie game Way, said that his team got a similar result by going through a similar process. He pointed out the character design makes it easier for players to relate to them. In Althea, the first prototype also adopted a similar philosophy - remove signs of race & gender so all players can relate to the characters. The characters were not even human-like, but still relatable. 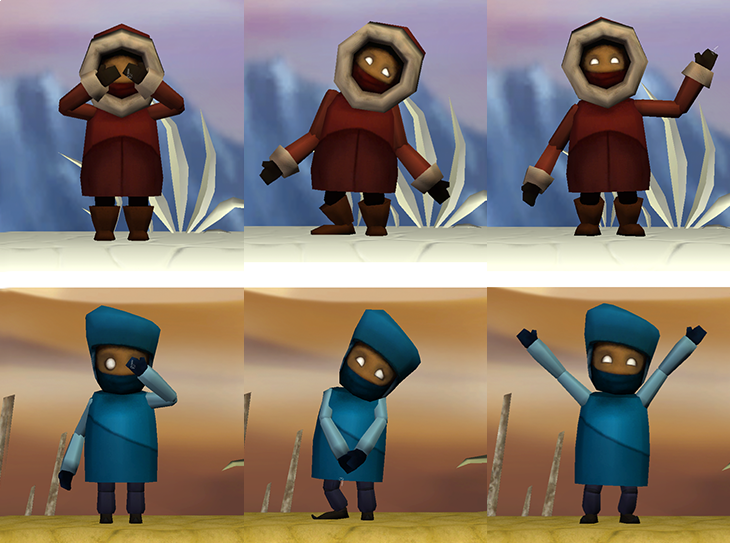 Later on, playtesting showed that the initial design could not help players understand the different between the two characters. We realized that stronger signs of archetypes can silently tell the player what a character is good at, so we designed characters with more exaggerated characteristics. Anyway, the point is still that simplifying characters can make them easier for players to relate to, and makes it easier for them to translate in-game relationships back to real life. But on top of that, the designer needs to think about the trade-off between relatability and understandability. After finishing this blog, I realized PUBG is also a good example for "amplification through simplification". Unlike Journey, who pushes player interactions to the friendly extreme, PUBG pushes them to the hostile extreme. I think it's part of the reasons why PUBG is charming - the only way you deal with an encounter with another player is to kill. All other choices provide the player with a smaller chance of survival. The simple interaction amplifies the feeling of tension. We’ve been talking about facilitating relationships through direct in-game interactions. The other way is to transform players through gameplay so they care more about their friends. One major technique is to evoke empathy. Our semester long project team was tasked to make a game for grade 3 and 4 neurotypical kids and transform their thoughts and behaviors toward their autistic peers by playing the game. Our first thought was to include autistic children into gameplay, and encourage mutual help between them and neurotypical students, just like what Althea did. However, autism is such a wide spectrum that we cannot assume autistic kids can play games with each other. So the only way to go, is to let neurotypical students empathize with them through the game. Then, we go through the debate of metaphor v.s explicit preach. We did research and playtest and found out that explicit preach may not work for kids, as they tend to go away from them. So now our task becomes evoking empathy for autism through metaphoric gameplay. The value of metaphors, or head fakes, is that once you get it, it’s super hard for you to forget about it. Our current idea is to let the player play the role of an animal, who needs to talk to various animals so they can cooperate to solve a crisis. The design is not mature enough so I will share one that I’m confident with. The player controls a fox, which is a nocturnal animal, and thus sensitive to daylight, and suffers from sensory overload during the daytime. When sensory overload happens, the game’s sound is distorted and volume is increased. So the player’s instinct will drive him to press the min-volume button on the keyboard. Sensory overload will be alleviated after he does so, but after a while, it will come back, and the player will press the button again. Therefore, the player naturally develop the habit of subconsciously, repetitively press one single button on the keyboard! That’s exactly what some autistic students would do - they repeat one behavior relentlessly. So when the player gets it, he will deeply understand some of their autistic peers’ weird behavior. There is a consideration when designing for empathy - avoid personal distress. Personal distress means literally let the audience suffer what others are suffering. Research shows that people tend to be less empathetic when anxious. And they would usually have the feeling like “I’ve been through that, no big deal, why are they yelling?” In games, it means it’s wise to avoid literal simulation, and a better way is to raise empathy through metaphoric gameplay. 1. Chen, J. (2013). Designing Journey. Talk at Game Developer Conference (GDC 2013). Retrieved February 22, 2018. 2. McCloud, S. (1993). Understanding comics: The invisible art. Northampton, Mass. Special thanks to Cole, Dan, Erhan and Euna, who provided valuable feedback for improving this blog post.